Posting and updating your Facebook Page status is an important part of maintaining your Edgerank. Too many businesses post infrequently and their Fans miss out on the Posts. As fewer interactions take place, the EdgeRank slips and even fewer posts are seen. 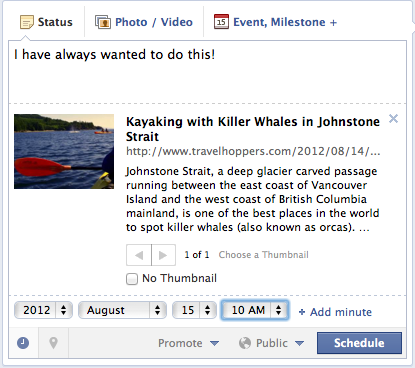 This year, Facebook introduced a feature to assist users with scheduling their posts in advance. The Facebook Scheduler is one of the “hidden” features of Facebook. Even many experience users do not know it exists. The built-in scheduler is not as full featured as programs like HootSuite, but it will suffice for many. The graphic below illustrates the use of the Facebook Scheduler. Note the small “clock” icon on the lower left-hand side of the status box. When you click on the clock, the “Post” button changes to a “Schedule” button and you can choose a time for your post to appear in hour Timeline. You can view your Scheduled Posts, change their schedule or delete them in your Activity Log, which is under the Edit Page menu. You often hear social media coaches caution against overt commercialsm on Facebook. You should avoid overt efforts at advertising travel specials or upcoming cruises to prevent your Fans from tuning your Posts out! However, you can offer to your Fans a way of researching travel specials on their own. TRO has developed a Facebook app you can place on your Facebook page. It comes pre-populated with some travel specials, but you can add your own as well. Inquiries about specials come directly to you with information on how to contact the supplier. You can see an example of the TRO Facebook App at www.facebook.com/where2travelnext/. Just click on the “Travel Specials” tab and you will see how the system works. It is free to travel professionals! Just register with us at www.where2travelnext.com and our support team will install the app for you on Facebook. A cautionary tale on scheduling. When the Concordia sank, Amex neglected to pull a promo on the ship. Be sure to review your scheduled posts to make sure they are still appropriate!